"No, I don't think this is . . . " Beth in the car ahead of us had turned through an opening in Avignon's ancient wall and Lisa was following . . . "the way to the parking garage," I finished under my breath. I could see a signaled entrance a few hundred feet farther along the perimeter road. Too late. We'd entered into the rabbit warren of tiny one way streets of an ancient walled city. It would take an unerring directional sense -- on a grey directionless day -- and a good bit of luck to get to the big underground parking garage from within the walls. Or luck enough to find two parking spots on the street. Beth stopped to ask someone. After much arm waving and pointing, we headed on into a skinny street despite a sign indicating a traffic blockage ahead. We proceeded a short way, but as Beth rounded a curve, I could see her turn her body back toward us, indicating a need to back up. We backed first, past the previous intersection. That's Beth, in the black car in front of us, turning the wrong way into a one-way street as a big piece of machinery proceeds toward her on our original route. Lots of shrugs to and from French motorists meeting us the wrong way . . . yes, they understand . . . and finally both our cars make heart-stopping left turns back onto the perimeter highway, then swing into the underground parking. We speed over speed bumps, around and around and around (thus this jiggly photo). Then Lisa decided to change directions and take the exit ramps instead, and shortly we found a big stretch of empty spaces. The first order of business was to find les toilettes, where we were reunited with Beth's crew. Someone coming out of a ladies' stall advised us it was drip-dry. We divvied up pieces of tissue. Several of our group who couldn't read French walked through a door that said Public Forbidden and didn't run into this paper problem. Hmmm. There are benefits to not being able to read French. What could they do to you, after all? We emerged into the grey day, sun barely poking through the overcast over the Palais des Papes. 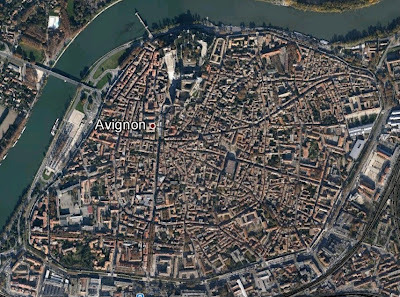 The large edifice dominates Avignon both physically and historically. The pope resided periodically in Avignon during the 13th century, then the permanent papal residence was set up here for six consecutive popes through two centuries. More on the popes in Avignon here. "The era of the Popes somewhat eclipses other events in what is a long and tumultuous history. At the crossroads of the big trade and migratory routes between northern and southern Europe and between Italy and Spain, the city played a major role in European history." Continue at . 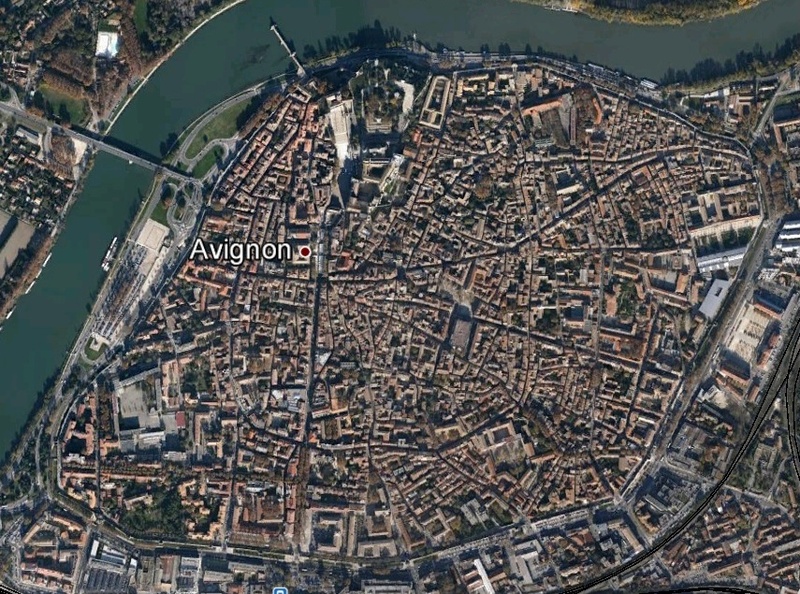 . .
We would be in Avignon for a relatively short time ... relative to the fact that the old walled city is of a fair size, and, as these cities that start with round are, exceptionally easy to get lost in. Thus, we were starting with a Petit Train tour of the city. They give a good overview and provide some ideas about where you might want to return to after the ride. With headphones in the language of your choice. Here are Sister and Linda in their seats in le Petit Train. Lisa and the other Linda approach to get on the train. Just to give an overview of the ancient city, here's one from Google Earth. Click on the photo to enlarge it. The pope's palace is on a promontory in the little wedge at the top of the circle. You can see this isn't your gridded city with a simple walk-around-the-block method of orientation. The train goes up the promontory, onto the palace grounds, winding through the gardens. We can look down to see grape fields below and the Pont Saint-Bénezet, or what you might have heard of as Pont d'Avignon in the children's song. It is no longer a bridge, but just a remnant extending out into the Rhone. I have clearer views of that later. There's an island in the Rhone to the west of Avignon, and past the second arm of the river is Villeneuve-les-Avignon, which also has some interesting ancient buildings. 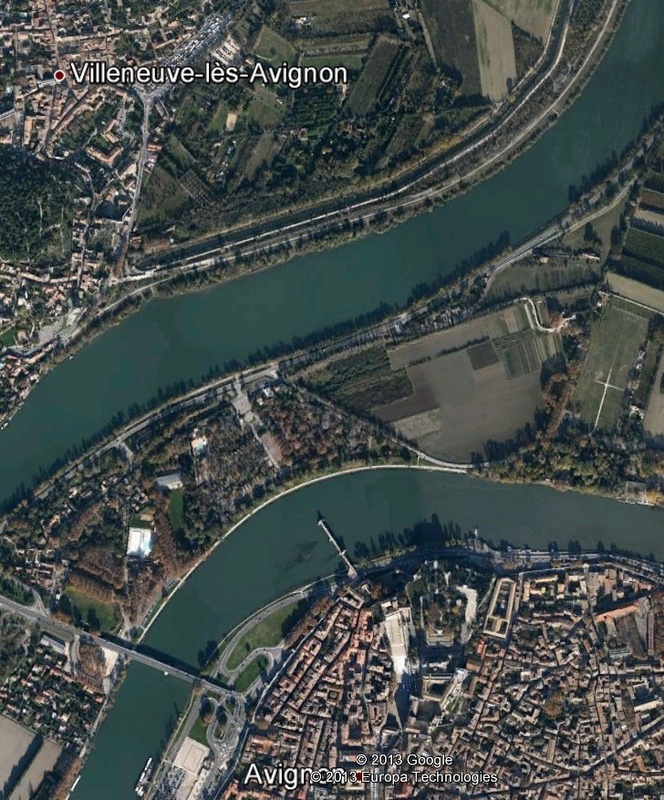 Again from Google Earth, you can see the split in the river, the island and Villeneuve, but note particularly in the lower branch of the river where Pont Saint-Bénezet extends out into the water. As in many of the towns of the South of France, living statues are peppered throughout the streets, earning donations from photographers and would-be photographers. Zorro here abandons his pose and lowers his head when this trainload of freeloaders drives by snapping photos. Beware the wrath of Zorro if you hope to freeload on foot! Window shots in this flash tour of Avignon . . . I've stayed at this hotel a few times with Jeanne's quilters tours. As you can see, it's on a hill. I think some of these hills account for the fact that le Petit Train in Avignon isn't as petit as it once was. Here's an eye-level view of Pont Saint-Bénezet, and the little chapel on it where Saint-Bénezet is interred and where Saint Nicolas, patron saint of the Rhone boatmen was once worshipped, until the clergy decided the chapel was in danger of being swept away. I just snapped this because I got a kick out of the proudly displayed one-star rating of the hotel. I don't know what the following NN refers to. They shopped, and bought santons and table clothes, and I resisted shopping for a time, then finally bought a tablecloth, and couldn't resist some coasters with funny cat cartoons on them. What? No pictures? I don't know what I was thinking. Or wasn't thinking. I did take a picture of my lunch. I decided to order a croque monsieur, which is the French version of a ham and cheese sandwich, very light and fluffy and topped with a creamy cheese browned under the broiler. They vary in their construction from place to place, but this has to be the very worst one I ever had. Lucky for the little sidewalk cafe that I didn't note its name! After lunch the ladies wanted to look at Mephisto shoes, so I took them to the store. Big sale going on, but unfortunately Linda couldn't get fitted in the pair she liked, and Sister decided that her pre-trip shoe binge had been quite enough for this summer. We headed out for a wine tasting later that afternoon and a slight disaster of a dinner out. But I'll leave those for next time. Super good reading! I want to know about the food disaster! Thanks, Nina. I have to get back to my itinerary production, but will get to the meal disaster soonish. Glad to see this post, it reminded me a lot of our time in Avignon in '07. Good times! Mehitabel, in a subsequent year we saw Jean-Luc driving a Petit Train, instead of our coach. :( I've looked at petit train drivers ever since, but have never seen him again. Ugh! My comment was completely lost.... sigh. Thanks for your nice comment. I hope you'll return.